I took about 30 minutes this Saturday morning while the kids were cleaning their rooms to make a slew of peanut butter and jelly sandwiches for the upcoming week. Armed with the confidence of freezer cooking many of our dinners for the upcoming month, I thought I’d go ahead and sneak in a few quick freezer cooking sessions like these easy PB&J sandwiches. Amelia “helped mommy” make a total of 50 PB&Js for the freezer. 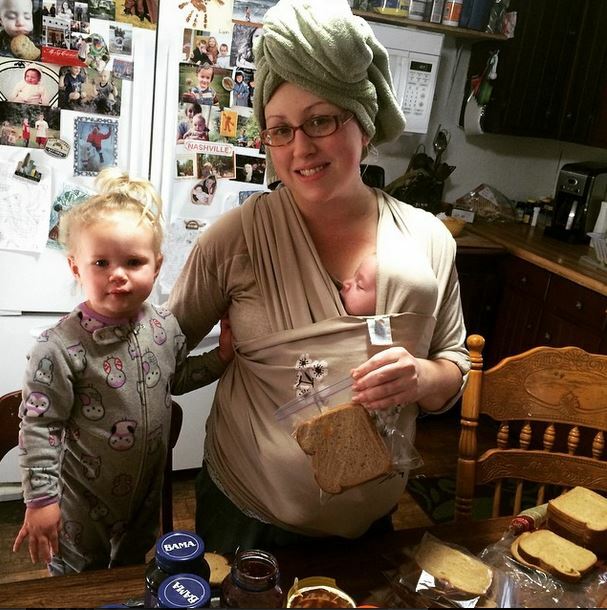 Sweet Daniel is hanging out in the Moby Wrap as usual. 🙂 I really don’t mind you all seeing me with no make-up and a towel on my head. I was thrilled that I not only got a shower on this day, but I also managed to get my roots colored. It was a productive morning for the family! My plan is to have a stack of these PB&Js standing ready in the fridge for a fly-by-the-seat-of-our-pants lunch as needed, or a quick kid-friendly snack for whenever. Because. Life. Now that I’m feeling like myself again after Daniel’s birth I’ll start sharing weekly videos on YouTube again. Please consider subscribing to my YouTube channel to support my efforts over there. I appreciate you! 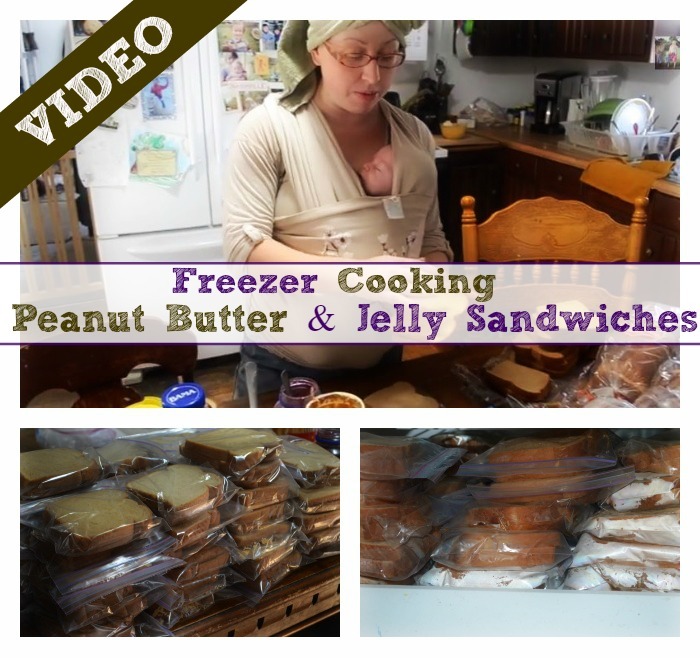 VIDEO Freezer Cooking: Making Peanut Butter & Jelly Sandwiches for the upcoming week! Click here to watch these freezer peanut butter and jelly sandwiches! 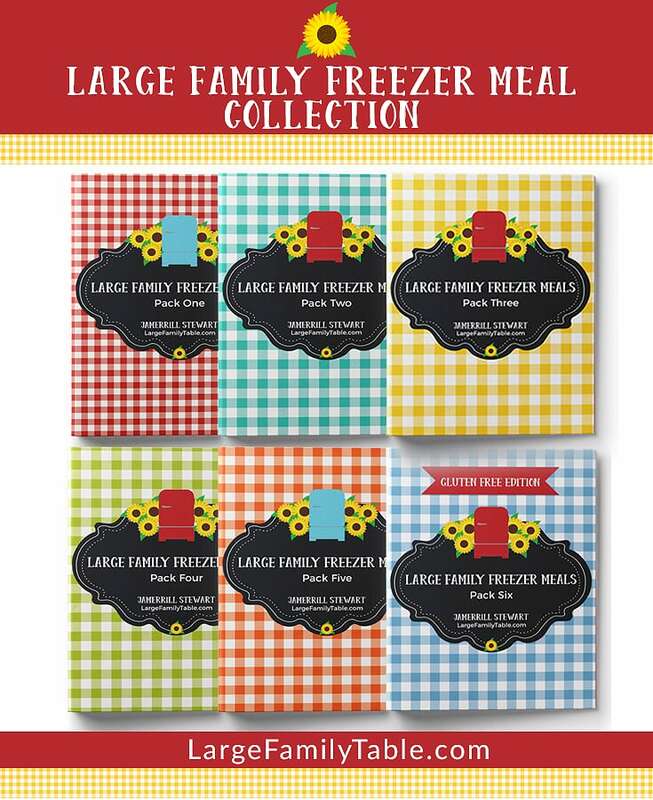 What are your favorite freezer cooking recipes? Do they get soggy at all? I have one who is a little picky with texture. I havent tried it but I thought I heard to put penutbutter on both pieces of bread first then jelly keeps bread from getting soggy (and I think that’s how the Smucker’s frozen sandwiches are). hi jamerill, will ham n cheese work sandwich freeze well? What kind of storage bags do you use? Are they regular or freezer?